After debuting the Laureato last year as a limited-edition model, Girard-Perregaux hit the floors of SIHH this year with a slew of new production versions. Not only is the new collection more competitively priced — compare the original's nearly $US15,000 (about $A19,385) price tag to $US10,000 (about $A12,920) for a comparable 42 mm steel watch from the new collection — it is also available in a broader selection of case sizes, dial colours, and choice of metals. The line now comprises a total of 34 variants — ranging from two 45 mm tourbillons all the way down to a handful of 34 mm quartz models — however for the sake of simplicity, we will confine our focus to its core models, the unisex 38 mm and men's 42 mm variants. 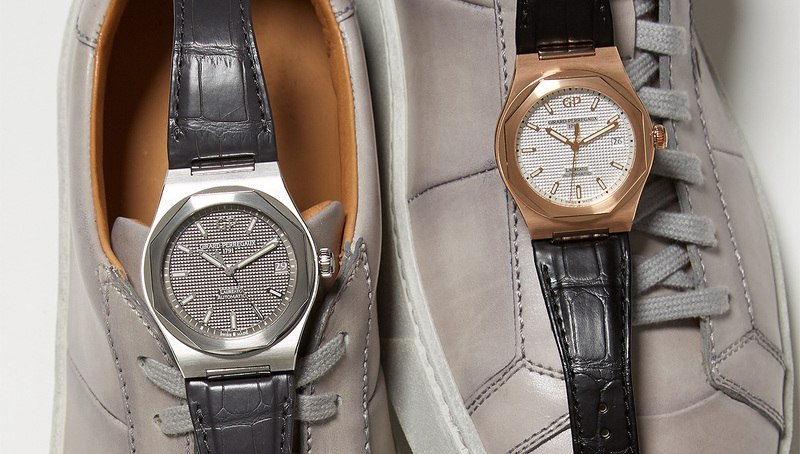 The Laureato's roots trace back to the height of the Gerald Genta era, specifically 1975. And while the piece was not created by the legendary watch designer, his influence is unmistakable. 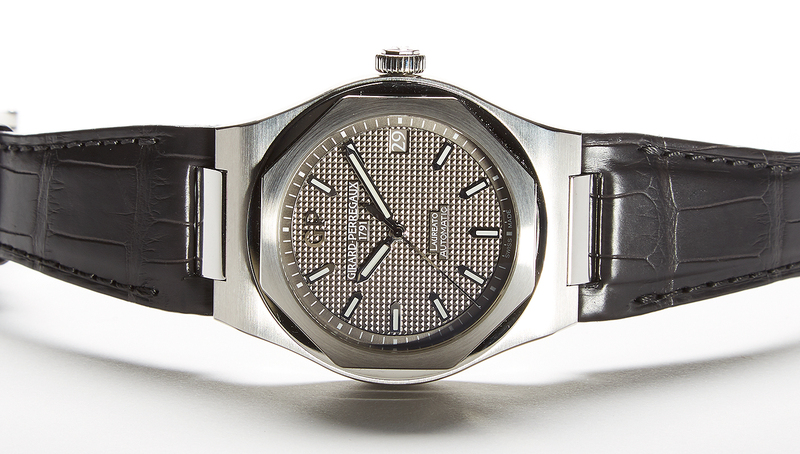 That said, the Laureato is so much more than another appealing Genta-inspired dress watch. It was (more importantly) a very early in-house quartz calibre from Girard-Perregaux, which played a significant role in the development of quartz movement technology. The GP-350 calibre that preceded the Laureato's GP-705 was the first quartz movement to run at 32,768 Hz — a frequency that soon became the standard that is used to this day. But enough of the history lesson; on to Girard-Perregaux's latest-and-greatest. It is important to note that Girard-Perregaux did not simply alter case shapes around an existing movement. As can be seen in the above image, the calibre fitted in the 42 mm model is clearly different than that of the 38 mm. The former is powered by the GP01800-0008, running at 21,600 vph and carrying a power reserve of 54 hours. The latter is the company's new 3300-series movement — designed specifically for the Laureato 38 — running at 28,800 vph and possessing a slightly shorter power reserve of 46 hours. The larger of the two is a mere 0.61mm thicker than its smaller sibling, a difference that translates to a case-thickness discrepancy of 0.86mm, which is really negligible unless you are examining the two side by side with the utmost scrutiny. Visually speaking, there is a lot to love about almost every dial and size variant of the Laureato. Available in silver, grey, or muted blue, each dial boasts an intricate hobnail pattern that catches light beautifully. And to avoid detracting from this effect, Girard-Perregaux matched each movement's date disk to the colour of each dial. 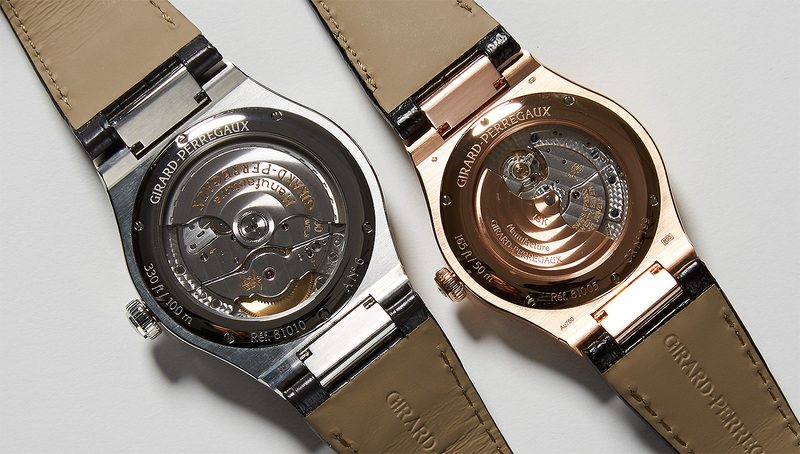 All three dial variants are quite understated, making the 42mm two-tone (pink gold and titanium) and the solid gold 38 mm the go-to choices for those wanting to grab a little more attention. As a matter of personal preference, I found the steel models work well on their alligator leather straps, but the gold example looks far better when paired with the bracelet. When it comes to fit and comfort on the wrist, this surprisingly is not simply a case of 42 mm vs. 38 mm diameters. If you're used to wearing 43 to 45 mm or larger watches on any given day, then the 42 mm is an absolute no-brainer. On the other hand, if your sweet spot is around the 39 to 42 mm range, the answer isn't quite so simple. Being a personal fan of that size range myself, I quickly noticed that the 42mm model on a bracelet wears a fair bit larger than the specs would lead you to believe, meaning that at least on bracelet, the 38 mm would be the perfect fit. Lo and behold, when trying on the exact same model on its contrasting leather strap, the 42mm suddenly wears smaller on-wrist, and the 38 mm variant seems a touch more petite than before. Unlike many other watches where sizing is easy to work out — the Jaeger-LeCoultre Master Control Chronograph being a prime example — we would strongly recommend heading to your local authorised dealer for a bit of a Goldilocks experiment to figure out which Laureato is too big, which is too small, and which is just right. And they're starting with a fascinating new coming to the Australian watch scene. The Lilliputian movement, the smallest manual-wound in watchmaking, makes a rare appearance in two new jewellery watches. Could Yoga be the ultimate cure-all?